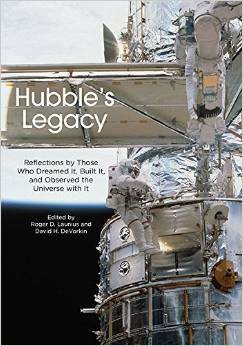 Hubble's Legacy: Reflections by Those Who Dreamed It, Built It, etc. The development and operation of the Hubble Space Telescope (HST) have resulted in many rich legacies, most particularly in science and technology-but in culture as well. It is also the first telescope in space that has been utilized as effectively as if it were situated on a mountaintop here on earth, accessible for repair and improvement when needed. This book, which includes contributions from historians of science, key scientists and administrators, and one of the principal astronauts who led many of the servicing missions, is meant to capture the history of this iconic instrument. The book covers three basic phases of HST's history and legacy: (1) conceiving and selling the idea of a large orbiting optical telescope to astronomers, the National Aeronautics and Space Administration, and the U.S. Congress, its creation as the HST, and its definition as a serviceable mission; (2) its launch, the discovery of the flawed mirror, the engineering of the mirror fix, subsequent servicing missions, decisions on upgrades, and the controversy over a "final" servicing mission; and (3) HST's public image after launch-how the mirror fix changed its public image, how the HST then changed the way we visualize the universe, and how the public saved the final HST servicing mission. Collectively, this work offers a measured assessment of the HST and its contributions to science over more than 23 years. It brings together contributions from scholars, engineers, scientists, and astronauts to form an integrated story and to assess the long-term results from the mission.